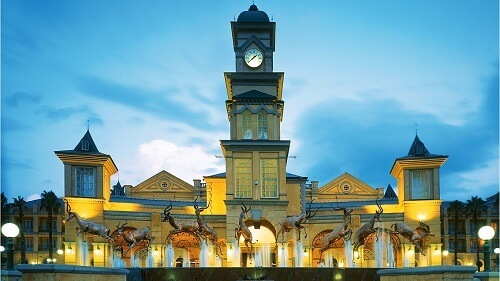 This casino, located in Ormonde, Gauteng takes the theme of gold mining and makes it beautiful. The region the casino was established used be a mining area, so it’s only fitting they use it as their theme. The gilded pillars may add to its charm but Gold Reef City Casino is known as a world-class gambling destination because of its high-quality facilities and service. Owned by Tsogo Sun, visitors will get the very best casino and hotel experience. Gold Reef City Casino’s location is convenient allowing all gamblers to easily access the Casino either day or night. The is a lot of other things at the site. These include a theme park and a museum dedicated to the apartheid era. The complex also offers a perfect venue for firms who might want to host conferences or any sort of prestigious business functions. This casino never sleeps, operating 24/7. Therefore, gamblers can play at this casino any day and any time. There are games for both those on a budget and the high rollers looking to splurge. The 1 600 slot machines split between the non-smoking area and smoking area, known as the Barney Smoking Casino, and Club Egoli for high rollers. Slots start at 1c and the table denominations range from R10 up to R500 accommodating every one financially. There is a full selection of games available include slots and table games. Visitors can play at the 23 tables of American roulette, Reef routine poker ,and the three baccarat tables. Furthermore, there are over 20 blackjack tables on the casino floors. The Barney Smoking Casino was specifically designed for smoking gamblers. It is said to be the biggest smoking casino in southern Africa with up to 600 slot machines to choose from. Then there is the Club Egoli is for the elite high rollers. This space has about 100 slot machines along with table games, private gaming, exclusive lounge facilities, and lucrative progressive jackpots. With the size of this casino and entertainment complex, Gold Reef City has a lot more on offer than just gambling. For those looking for a thrill during the day, there is the Gold Reef amusement park across the road from the casino. It has three adrenaline-pumping rollercoasters and a lot more exciting rides in between. Spend the day with the family enjoying the candyfloss and popcorn on sale, and take a stroll through the Gold Reef’s petting zoo. There is also the Apartheid Museum which is opposite the theme park. It was built in remembrance to the atrocities of Apartheid South Africa and those that gallantly fought their oppression. There is a wide variety of bars and restaurants on this complex inclusive of fast food courts and fine dining restaurants. There is something for every taste, including pizza, spice curries, seafood, and South African cuisine. For those looking to spend the night, Gold Reef City has two four-star rated hotels. The Southern Sun Hotel has 38 luxury rooms, while the Theme Park Hotel has 75 luxury rooms. Their level of service takes you back to a time when butlers and maids served their guests whims. Take a trip to Gold Reef City over a weekend with the family, friends, or significant other. There’s so much to do here you won’t need to leave this city within a city. For more on casinos in Gauteng, take a look at our comprehensive guide.